The flow of people streaming through Bill Whitsett’s downtown guitar shop is full of surprises. There are soccer moms and heart surgeons. Closet shredders and guys who busk on the streets. Even the occasional folk rock legend, like Tom Rush, who walked in one day with a busted vintage six-string. “It’s a good cross section of humanity that comes through those doors,” says Whitsett, a burly bearded guy who looks one-part lumber Jack and one part artisan in a work apron. Some play because they have to. Others play because they want to learn something new. Whatever the reason, by the time they get to the bottom of the stairs, they all have the same thing in common. Calling himself a part-time luthier and a full time repair technician, Whitsett credits “luck and Facebook” for propelling his business to success. Once he did, the comments started rolling in. He developed a worldwide audience, including a fan in Japan who would significantly change his life. A guy named David Leonard from Brighton married a Japanese girl and relocated to the other side of the world. He stumbled across Whitsett Guitar Works on Facebook when he was trying to fix his own guitar. Leonard became a regular, sending in questions and seeking advice. Instead of taking his guitar to a repair shop in Japan, Leonard found a school that made guitars and enrolled. When the school heard about Whitsett, and watched his works in progress online, he was invited to come and build a guitar at the school. They even offered to help fund the trip by putting Whitsett to work in their workshop. He spent the month of January in Japan working alongside master luthier Kiminori Hayashi. The rhythm of construction did the talking for them. Theirs is the kind of art that begins with carpentry. It’s about knowing the wood. Whitsett plans to roll out his signature small body guitars this year. No one in Whitsett’s family was a carpenter. Like a man lost at sea, he pulled for a life preserver and caught a piece of spruce. A North Carolina transplant, Whitsett learned to build and repair guitars at The Guitar Hospital in Grand Rapids, Mich. He opened his Lowell shop at 181 Market Street in 1999 and today, does work for every major guitar retailer. A few weeks ago he moved to a larger space down the hall in the same building, tripling the size of his business. The new digs has two floors, an intimate theater with a small stage and in-house guitar lessons, courtesy of Liz Lawrence from Root Note Studio. Guitars at all stages of production hang at every angle. On his workbench, a Gibson from the 1930s awaits surgery. Beside it, a 1926 Sears and Roebuck guitar with mother-of-pearl inlay is also in need of some critical care. Like any old timer that’s seen more than a quarter of a century, their voices have changed and mellowed. Still, there’s life left and it’s music to Whitsett’s ears. Tom Rush came in with one of the primary guitars he uses on stage — a handcrafted acoustic beauty made by Don Musser, circa 1972. “I remember thinking, this guy looks like someone who’s music I have on my iPod,” Whitsett says. Bob Dylan, Eddie Van Halen, Neil Young and Bono are just a few who enjoy making music on a Musser. Rush’s instrument was the second guitar Musser ever made and it was pretty banged up. Whitsett serviced it and as far as he knows, Rush is still using it on stage today. For more information visit WGW’s Facebook page. Or check out the WGW website. Inside a basement workshop in Lowell’s Highlands neighborhood, a southern flavor is carved from wood and the soul of a diddley bow. It’s in this space, Carl Johnson cuts, shapes and hammers mahogany, putting a modern spin on an American classic — the cigar box guitar. Let’s time travel about 150 years back to the deep south. Poor southerners who couldn’t afford a real six string began taking simple household items and making music with them. It was around the time of the civil war, and music made life better. Porch jam sessions helped people forget the things that ailed them. Well, that and a little moonshine. Washtubs. Spoons. Kazoos. Whatever you could get your hands on you’d play. The cigar box was just another name for the diddley bow. One, two or three strings were fastened to a board or a broom handle. Players plucked and slapped, used glass or metal slides. Growing up, Johnson’s dad, Al, was a master carpenter. A throwback from the school of do-it-yourself. By the time he landed in sixth-grade wood shop, Johnson knew about as much as the teacher did. He was 11 when he got his first guitar. A Harmony acoustic. Then he met a young drummer in class named Justin Beaulieu, and was introduced to a guitar virtuoso who helped changed his life. Justin’s stepfather, Robert “Nut” Winters, taught Johnson the way of any guitar player worth his or her salt — how to let your heart flow through your fingertips. As a musician and a carpenter, functionality was important to Johnson. He performed surgery on his own guitars, taking them apart to see how they ticked from the inside and out. Eventually, he started fixing other peoples’ instruments and coming up with inventive ways to make his own play and sound better. He made a volume box to have smoother taper volume control over a tube amp. That was in 1998. Since then, he’s sold more than 15,000. Guitar pedals followed. Wanting to lug less equipment around, he engineered a series of pedals that have two variations of classic vintage sounds in one portable device. 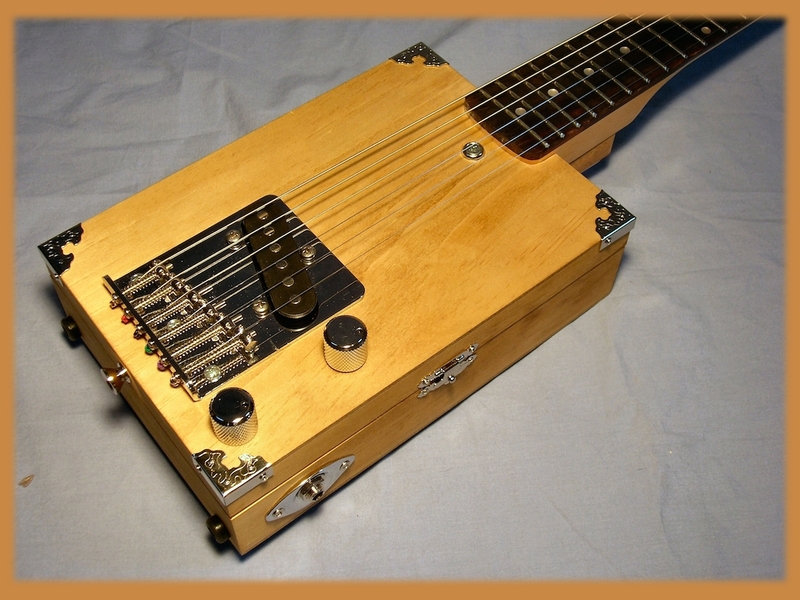 Then came his signature small body guitar, inspired by the diddley bow. Blues legend Lightnin’ Hopkins played his first lick on a cigar box guitar during the Depression. In the 1940s, BB King got his huge hands on one and in the 1950s, Mississippi-born Ellas Otha Bates — who began calling himself Bo Diddley — recorded the earliest of his hits playing the chug-a-lug rhythm on an electric instrument shaped like a cigar box. Hendrix learned to shred on one. Billy Gibbons of ZZ Top sometimes busts out his. And Tom Waits is known for strumming a cigar box banjo. Al Johnson took one look at it, disappeared in his worship and came back with the answer. The finished product, Johnson says, has the warmth of a semi hollow body guitar combined with the bite of a solid body. “And you’ve got some space inside to store picks, cigars, whatever you want,” he says. Strike a chord and you discover the roots of American music — Southern culture, chewing tobacco, swamp meets — all rising up and floating out from a little house in Lowell. Online sales have helped put Carl’s Custom Guitars on the map. His boutique-style products regularly travel around the country and the world. Check out Carl Johnsons’ one-of-a-kind made in Lowell items at carlscustomguitars.com.